Photo: Adam Brinson House, ca. 1934, Historic District, Twin Cities, GA. The log cabin was constructed for use as a meeting hall by families of the newly formed chapter of Daughters of the American Revolution (DAR). 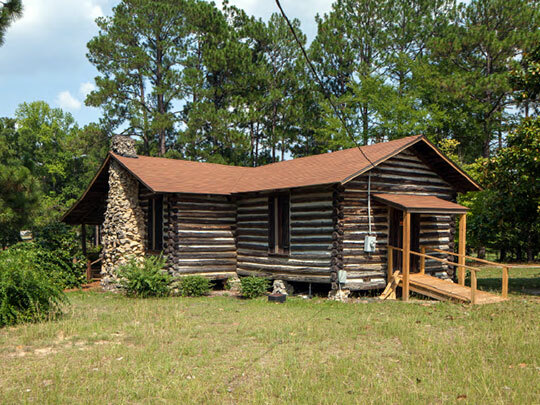 It was built out of pine from trees that were felled during a 1929 tornado. The Historic District was listed on the National Register of Historic Places in 2013. Photograph by Charlie Miller, Georgia Department of Natural Resources, 2012, for nomination document, Twin City Historic District, Emanuel County, GA NR# 13001168, National Park Service, National Register of Historic Places, accessed September, 2014. The Emanuel County administrative offices are located at 101 North Main Street, Swainsboro, GA 30401; phone: 478-237-4881. Established in 1812, the county is named for David Emanuel who served as governor of Georgia in 1801.